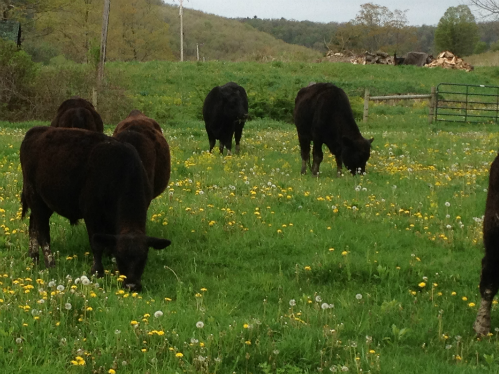 Eco Valley Farm is a 100% Certified Grass Fed, USDA Certified Organic Black Angus Ranch located in Allegany, NY. Started seven years ago with four head, we currently average 25 head with growth expected to reach 60 head in two to three years. We raise 100% Grass Fed Certified, pure Registered Black Angus Cattle using agro-ecological processes. Black Angus is the most common beef breed of cattle in the US. They were developed from cattle native to the Counties of Aberdeenshire and Angus in Scotland. Because of their native environment, the cattle are very hardy and can survive in an environment like Scottish winters, which are typically harsh with cold and snow. Our 67 acre ranch is proudly certified, internationally, as an Animal Welfare Approved farm. Eco Valley stands as the 4th AWA farm in the Northeast United States. We are also a Beef Quality Assurance-Beef/Check-Off farm. This assures our customers, our farming peers, and our community that we farm with respect to the cattle and the land and that we promote Sustainable Farming and Rotational Grazing by International and USDA Standards. People want to know where their food comes from, and we welcome visitors at any time so that we can provide that assurance to them. The better animals are treated in their growth years, the healthier the product is when processed and provided to the public. That is what Eco Valley Farm is all about!